Are you always worried that your pets don’t get the right amount of food during their mealtime? Sometimes we forget to feed them at the appropriate time, especially when we’re not at home. 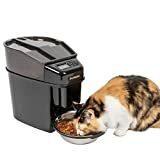 Good thing there are automatic pet feeders that can do the work for you and prevent your pets from starving or overeating see all cat and dog food dispensers here. We’ve summarised the top 5 automatic pet feeders that are worth trying. The Petnet SmartFeeder is an automatic feeder that can be controlled using a smartphone app. The smartphone app determines the amount of food it gives to your pet based on their age, weight, and activity level. It is designed to feed your pet the right amount of kibbles or any dry treats each day, reducing the chances of overfeeding them. The app allows you to monitor your pet’s meal, receive notifications if your pet has eaten their meal, and determine if the feeder needs refilling. 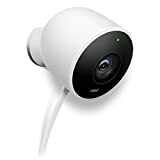 The Petnet SmartFeeder can also be integrated with the Nest camera and Amazon Echo. Talk & listen. Speak to get someone's attention or tell the postman to leave the parcel by the door. Pros: Excellent concept to remotely monitor and control your pet’s meals. Cons: Wrong-sized treats may jam the machine. The PetSafe Healthy Pet Automatic Feeder can be used with most dry and semi-moist foods. It has a conveyor belt inside that dispenses food into a stainless feeding bowl. The bowl can hold up to 5 cups of food, while the whole feeder can contain up to 24 cups of treats. The bowl is completely removable, making it easier to clean. The feeder also has a secured lid to prevent your pets from prying it open. It has a programmable digital timer that allows the pet feeder to dispense meals up to 12 times a day. The amount of food dispensed is flexible and can be configured on the keypad integrated into the machine. It can run using batteries or it can be plugged into a wall outlet for power. Pros: Easy to program, clean, and set up. It can also be powered by batteries. Cons: It’s quite flimsy, making it easy for dogs to topple it over. The Arf Pets Automatic Pet Feeder automatically dispenses food onto a dishwasher-safe plastic bowl. The amount depends on the configurations you’ve set for it. You can schedule up to 4 meals per day and adjust the meal portions through the keypad situated above the dispenser. 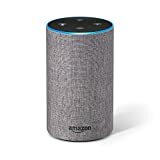 It also features a voice-recording function, allowing you to record sounds and commands that the machine can automatically play back when it’s time to feed your pets. To operate, you can either use 3 D-cell batteries or simply plug it into an outlet using the adapter included in the package. This pet feeder accepts most dry pet foods. Its 1.14-gallon food container has a lid that has a magnetic lock to prevent pets from forcing it open. The food container and the bowl can also be removed for easier cleaning. Pros: Easy to configure and use. Cons: Feeder may get jammed after some time of use. The Feed and Go Pet Feeder is a sleek automatic feeder that features a webcam accessible through any device that runs on iOS, Android, or Windows. You have to connect the pet feeder to your Wi-Fi network to make it work. Once you’ve set up your online profile, you can configure the timing and the amount of food to dispense. The feeding history and other useful data pertaining to your pet’s feeding habits can be seen on the portal where you created your profile. 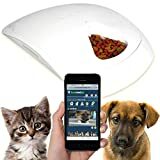 Feed and Go Smart Pet Feeder With WEBCAM & WI-FI Built In. WET & DRY Food Friendly, Control From Anywhere With Any Computer/Tablet/Smartphone (Inc iOS, Android and Windows). The Only Smart Pet Feeder For Wet/Dry Food, Treats & Medication. Measures 18L x 16W x 3H (inches). The Feed and Go feeder can handle wet and dry foods, medication, or treats, making it a versatile pet feeder. Pros: You can configure the feeder’s settings and access its webcam using the Feed and Go app. Cons: The tray may get stuck, preventing full access to the stored food. The PetSafe pet feeder features 5 small feeding compartments and a lid that covers them all. The lid has a hole that reveals the food underneath it, controlling your pet’s food intake. When it’s time for them to eat, the feeding compartments will rotate to reveal through the hole the next batch of food available. This pet feeder is made of BPA-free plastic which means it’s safe for food use. It’s also dishwasher safe, making it easier to clean. Pros: It can be used on dry, wet, and semi-moist foods and treats. Cons: Pets may be able to open the container, allowing them to eat the food on all the compartments. You won’t have trouble switching from a regular food bowl to these pet feeders because they were designed to enable pets to easily adapt to using them during their mealtime. There are different automatic pet feeders suitable for every budget. You can go for those that aren’t too sophisticated and simply base their feeding schedule on the time you set on the machine. The more expensive ones can be monitored and controlled through a mobile app or an online portal, making it easier for owners to monitor their pet’s feeding habits even when they’re away from home. For more information on all these great products please visit Angela’s Blog. Great overview with a lot of information. We did a similar review on the top wi-fi pet feeders, here. Take a look for comparison. Next post Should you walk your dog in cold weather?